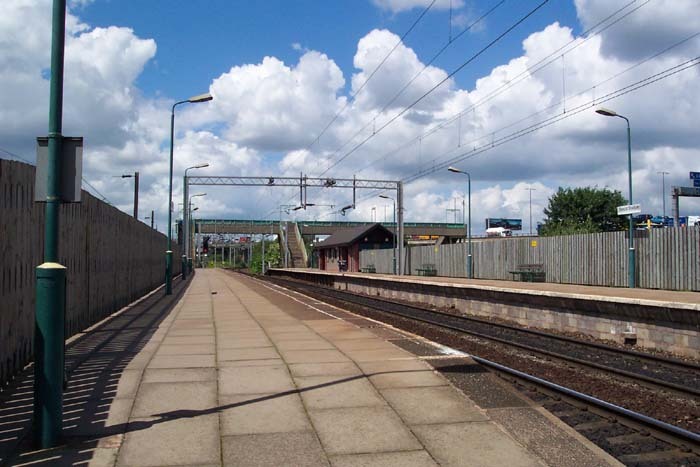 The South Staffordshire Railway saw the merits of having a station in the heart of Walsall and opened its line from Bescot to a new station at Bridgeman Place in 1847, itself replaced in 1849. 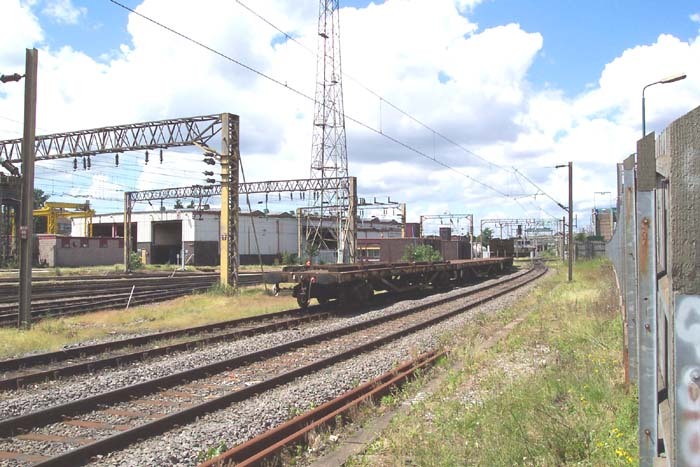 Under the LNWR, who absorbed the SSR and GJR, extensive goods facilities were developed at Bescot from 1881 onwards that are still in use today. 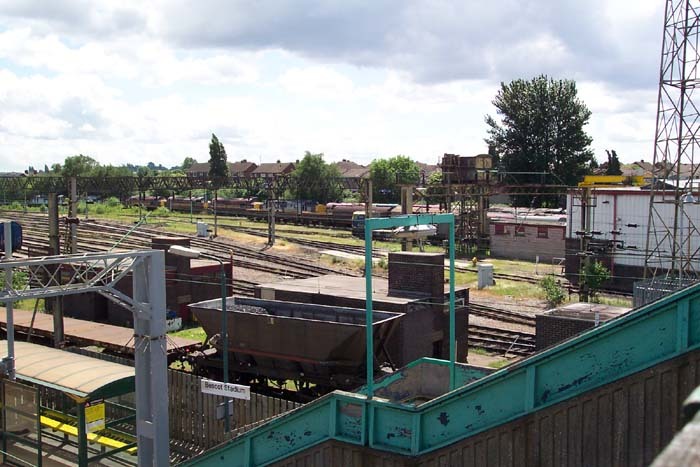 The yard was rebuilt in 1966 for a cost of £1.5m to handle an estimated 4000 wagons a day - the passenger station is somewhat dwarfed by its surroundings and is now known as Bescot Stadium following the opening of the nearby Walsall Town FC ground of that name in 1990. Above we see the less-than-inviting entrance to Bescot Stadium station from the car park on Bescot Crescent in the shadow of the M6. 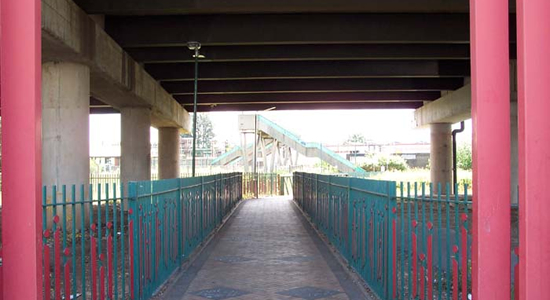 To enter the station requires walking under the M6 ahead and once beyond that, the walkway crosses the River Tame after which point you have to climb the footbridge that provides access to the two platforms. 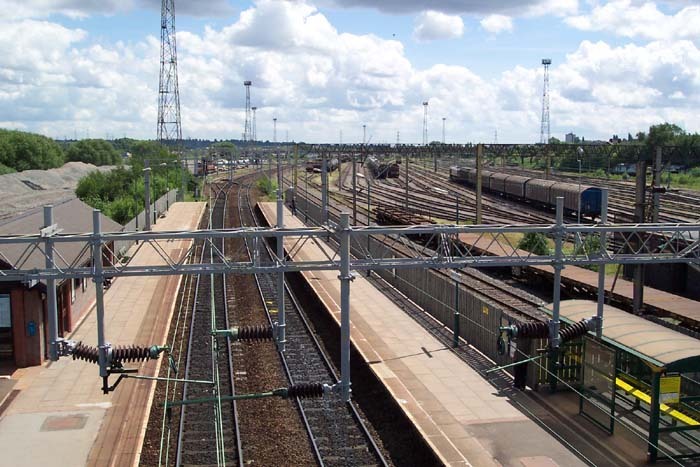 Above-left we are on the station footbridge looking in the direction of Birmingham across the yard. The current station is of a very modest size and seems somewhat of an after-thought tucked out of the way in a bit of space the designers had left over when planning the goods facilities. Above-right we are on the Walsall platform looking along the length of the station towards the footbridge. On the Birmingham platform is the small station building and waiting room which, whilst a little more interesting than the ubiquitous bus shelters provided at many contemporary stations, hardly serves to excite when entering the station. 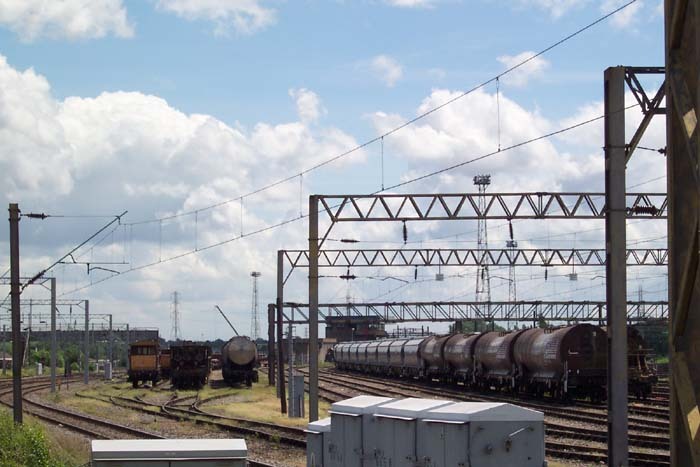 Above-left we are still on the Walsall platform but this time looking across the yards and can see some flat-bed wagons at rest and beyond that the imposing structure of the EWS Traction Maintenance Depot. 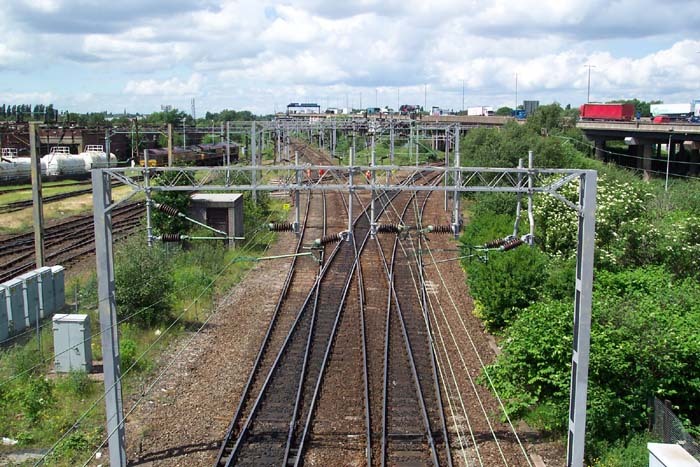 Above-right we are in the same spot but this time looking in the direction of Birmingham to see some of the range of wagons that pass through the yard and beyond them the signal box can just be made-out. Above-left we are back on the footbridge looking across the yard with the station to our left. Above-right we are on the footbridge watching the track head-off to Walsall to the right, and Wolverhampton to the left ahead. Whilst the station itself at Bescot is of little if any interest to observe, the site itself is well-worth a visit for the rolling stock and locos on display. I have included some of the photos of the vehicles themselves on the Train Photos page.